I finished it today, what do u think pp? looks good. how did you make the ring of fire. Waahhhh... It's cool. The fire thing is good. 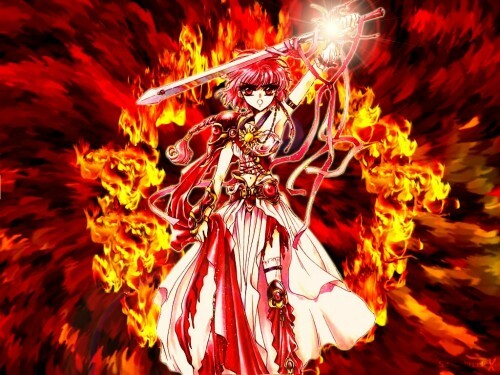 wow, the fire efect its perfecto, and lucy does look awesome, her looks are realy nice.. It's too bright in my opinion but it really suits Hikaru, or Lucy as you call her. i have this weird feeling that you first watched Rayearth when it was aired in ABS CBN or something. That is an awesome picture. The background goes perfectly with Amazon Hikaru, and the whole thing looks seamless. Wonderful job.